Virtual objects are usually less than meets the eye when it comes to heft and feel, and sights and sounds only get you so far in creating simulations. Virtual reality systems could use a bigger dose of reality to cure their tendency to leave users empty-handed. 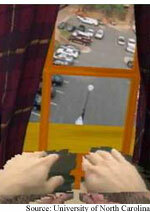 A system that makes real objects players in virtual environments creates a hands-on experience. A method for making intricate networks of artificial blood vessels brings the decades-old dream of growing replacement organs a big step closer. The networks are designed to provide the support structure needed for organ cells to coalesce into something greater than the sum of its parts. The key is taking advantage of one of nature's favorite patterns -- fractals. Giving computers the ability to discern where you are looking means, among other possibilities, setting screens to go dormant when they don't have your attention. The technology has been around for years, but the trick to making it practical is keeping the energy-saving mechanism from using more energy than it saves. Handheld detectors could one day allow you to monitor your body for cancer, your water for toxic chemicals, and your food for nasty bacteria. Making these devices means developing inexpensive electronics that are capable of detecting trace amounts of substances. One candidate is a chip containing DNA-tipped carbon nanotubes. Laser bursts pierce fog... Electricity loosens tiny bits... Nano light stores data in polymer... See-through magnets hang tough... Munching microbes feed fuel cell... Crystal cracks nurture nanowires.